If you are American and want a feel good story this ain’t the one… so please come back tomorrow and I will try to do better. Anyhow, I saw this article the other day and didn’t have time to comment on it until tonight. U.S. employers added 132,000 jobs in June according to a report July 6 that pointed to solid growth in the world’s biggest economy. However manufacturing lost 18,000 jobs. Whenever I hear statements like this I immediately go on a hunt for the data since many times reporters over react to plain old common cause variation. So tonight after some digging around on the U.S. Department of Labor Bureau of Labor Statistics website I accessed the actual data and created the graph to the left. 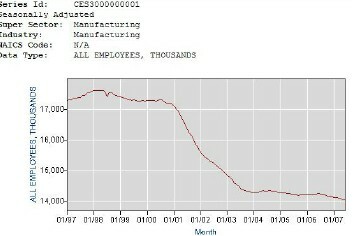 I took the last few years manufacturing employment data. In this case, my fellow Americans, the trend is not our friend. On the BLS website you can also create your own graphs so I took the last 10 years worth of manufacturing employment data to see what I could learn. It seems that little recession was a real bugger after all. And on the bright side of things the last few years don’t seem quite as bad when you put it into this perspective. Scary (and dangerous) how we can rationalize things with pictures. If you enjoyed this post (well you know what I mean) please subscribe to this blog via RSS feed. I certainly agree USA manufacturers have to adopt lean manufacturing and six sigma methods. I would point out that manufacturing jobs are being lost globally. The strongest trend is a reduction of jobs everywhere (then there are national trends that can adjust that trend somewhat for particular countries – basically how fast each country is losing manufacturing jobs). The USA is losing them more slowly than the average (though that data is getting a bit old still well within the period of time people have been concerned about the loss of manufacturing jobs in the USA 1992-2003) – meaning of course that the share of manufacturing jobs in the USA compared to the entire world is increasing). The other thing to remember is the USA is still by far manufacturing more than anyone else. I take it the red line is the trend, right? Not a nice picture if Uthis is the case. Richard, yes the red line (top graph) is the trend and an ugly one at that. 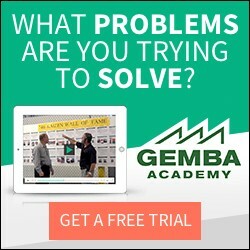 Unless management learns to respect and develop people, the most important cultural underpinning of lean, lean will only be viewed as a cost cutting initiative (and it will fail)instead of a means of delivering value to the customer through engaging the whole team, the only truly effective way to ensure your company’s longevity.